Choosing "the right" curriculum can be a challenge for homeschoolers. Does it match your homeschool philosophy/method? Is it interesting and engaging? Is it teacher-intensive? Does it match, or can you balance it out with your family's religious views? Will it challenge, without overwhelming, your kids? There are so many aspects to consider that it can feel overwhelming. This week during the Virtual Homeschool Fair we're discussing Our Homeschool Curriculum, so I think now is as good as any to do a mid-year update, since we just had a major curriculum overhaul and finally made it through the first term of the new program. I fully admit to being a curriculum junkie. Thankfully I've had the Schoolhouse Review Crew to provide a steady flow of new curricula and supplements to satiate that desire to "change things up" all the time. Despite this, I've still bounced around a little over the years. Nothing drastic; I haven't gone from one extreme to the other; we've always been literature-based and relaxed homeschoolers, but this year we've circled right back around to where we started. When I first discussed Transitioning to Ambleside Online, I mentioned that we had actually started there, but we got off to a rough start and I fell into into that "maybe there's something better out there" trap. I'm not going to rehash all of the backstory, or how I circled back around to AO (you can read that post for the details), but I will say, I have learned a few things from changing curricula a few times since then. I have learned that I need to learn to be content with what is working and not try to find something "better" just for fear of missing out. I should want to find the best, but only when what we have is not working. There's no need to be constantly hunting for the next best thing, because something shinier will always come along. I have also learned that I can love something, but I have to know when it is time for my children to move on. Even a beloved or rich curriculum may not always meet our needs. So here we are with Ambleside Online, and we've finished the first term, so I thought now would be a good time to share some of our thoughts so far. I love it! The books are fabulous. They are truly living books. They are literary and interesting, though definitely challenging. My kids have been stretched and one son in particular was really pushed out of his comfort zone, but in a good way! Out of all of the books that are assigned between Years 2 and 4 (we have only omitted a few, and even that is only temporary--I have plans to work them in eventually) the boys like almost all of them, they even seem to love several of them. I find a couple of them tedious to read, but those are ones they enjoy, so I let it be. I am just so impressed and thankful that a group of homeschool families, not being paid for their effort, have managed to put together something so engaging and thorough and have shared it for free - and that it is so effective! My Year 2 son of course loves The Burgess Animal Book for Children, because science is now all animals all the time. He also really seems to love Our Island Story and A Child's History of the World, I think because of all the connections he is now making. I may try to get around to going more in-depth about the kids thoughts and progress with their individual years, should I find the time after this series is finished. I really love how the schedule is designed. It's laid out so that it says what to read each week, but I get to assign the days we read those passages. They have a variety of formats too, so I took an editable schedule and tweaked it to meet our needs. For instance, I deleted the Bible reading lines, and changed the name of the poets, because we already had something in place for these. There were a few small tweaks otherwise, which I addressed in Transitioning to Ambleside Online Year 4, the transition and Ambelside Online Year 2 - The Transition. Those tweaks were mostly based on already owning a suitable alternative book or keeping the boys together for a subject. I typed up a quick grid that tells me which books we'll read each day. I tried to spread out the subjects so we aren't reading two books from the same subject in a day. I tried to keep Wednesdays slightly lighter, so I don't feel rushed in the afternoon into the evening before church. Then Thursdays are off for co-op, which is enrichment subjects. Fridays are lighter, so that if we don't finish a passage, or if it's longer (like two chapters for Burgess Animals) we can just roll it over to Friday and finish then, or otherwise we just finish early! I also read some stuff over lunch most days, usually poetry and a "free read" book that is for everyone. I have to rearrange things for my oldest for second term, as a few books are added, but we'll see how things go. We might slide a morning reading in on Thursdays if necessary. I never follow my Enrichments schedule, so I intend to update it. Then AO offers a blank grid for daily and weekly subjects (math, copywork, dictation, etc.) along with their term schedules, and I can add/delete rows before I print, to customize it for each child. I just do a checkmark inside the box each time we complete those! Daily subjects should have at least 3, preferably 4 subjects by the end of the week. It's easier than creating my own daily/weekly schedule, and saves me time and energy! I have a total of three papers per term for each of the big kids - The Reading Schedule, The Daily/Weekly tasks, and my weekly subject guide. When following a CM education, it is a broad and rich feast. There is so much to offer, and I am using many elements of Ambleside Online's riches, and following our pre-AO schedule for others. Next week we'll be discussing Enriching Our Homeschool, so without giving too much away, I just want to say that I considered myself a "good" student - I got straight A's and I liked learning, reading, and going to school, and I feel like I missed out on so much by not having the same depth and breadth that I am able to offer my kids. There's just so much to discuss next week, though! We are following AO for History, Geography, Literature, Science and some of the riches. We're doing our own thing for a few other subjects. Lang Arts: We're following AO/CM with narration, copywork, cursive practice (Y2) as well as dictation and weekly written narrations (Y4) My oldest has done enough grammar for awhile, so we'll do a crash course down the road. Choir: We have someone who has volunteered to start a junior church choir, and my 3 oldest children are participating in it! So overall, things are going well this year. We obviously had some bumps in the road early on, but now that we have switched to AO and I have a schedule to keep me consistent and moving forward, we've made a lot of progress and our days are smoother. I must admit though, that it isn't so much about finding "the perfect curriculum" as it is about knowing when and how to make the changes that are needed. It's about having the mindset of making the curriculum serve us, not the other way around. It's about finding a curriculum that is academically engaging, but also brings beauty and joy to the day. Looking for more curriculum ideas? Visit my fellow homeschool bloggers! 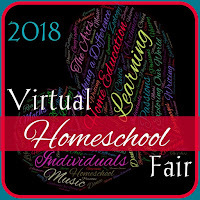 The Virtual Homeschool Fair is hosted annually by Susan @ Homeschooling Hearts and Minds, and here are my posts for this year. I struggled to commit to AO the first time, but now that we're further in our homeschooling journey, and I can see how AO works at higher levels, I think I finally have the confidence I lacked in the beginning! I have heard from others who really like Ambleside Online as well. As long as the material works it's great eh? It's a really rich curriculum, that's for sure! Aren't we lucky that we now have so many great options thanks to the homeschoolers before us! I am also guilty of looking for the next best thing. Glad to see you too have found something worth sticking with. What a blessing. Oh, I too am always looking. Clearly my daughter learns different than me, and I think that's one reason I'm always looking. I can't actually bring myself to believe that the method we use is best for her, because it's not for me. Still, I'm trying to learn to leave well enough alone. 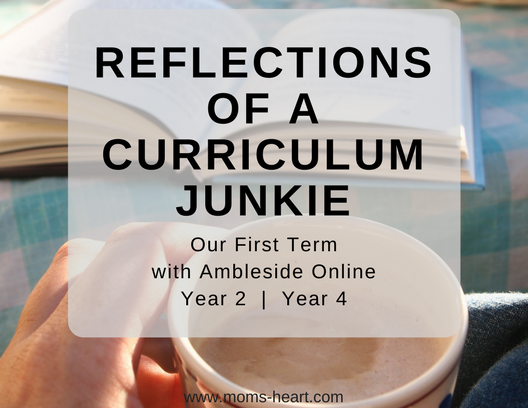 I've used Ambleside Online a few times as reference when developing my courses for my now high school daughter. I loved it, but never could commit to using it as is designed.